For a lot of the public, the behavior of police officers is a mystery. We often only hear about the police when an encounter with the public has gone horribly wrong and people ask, “What was that cop thinking?” Adam Plantinga, a sergeant with the San Francisco Police Department, is ready to explain with his new book Police Craft: What Cops Know About Crime, Community and Violence, just released from Quill Driver Books. In Police Craft, Plantinga shows with honesty, compassion, and humor what the police officer’s job looks like from the inside. The work is hard, frustrating and often futile. The psychological toll of dealing with danger, violence and death is considerable. And there is always the possibility that any encounter with the public can go terribly wrong. Each chapter of Police Craft tackles a specific element of the police officer’s job, ranging over a wide range of topics: how investigations are conducted, handling of evidence, the sociology of crime and addiction, the realities of danger and violence, and more. 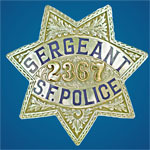 Not hesitating to confront controversial issues, Plantinga presents a police officer’s views on police shootings, racial profiling, and relationships between police and the community—and offers reasoned proposals on what the police and the public can do better, including better training, greater transparency and improved leadership. Hard-boiled, sincere and surprisingly funny, Plantinga wrestles with the complexities and contradictions of a job he loves in which he witnesses so much suffering. Transcending today’s strident pro-cop/anti-cop rhetoric, Police Craft will give every reader a greater respect for the police and greater understanding of the job they do. Get your copy of Police Craft here!